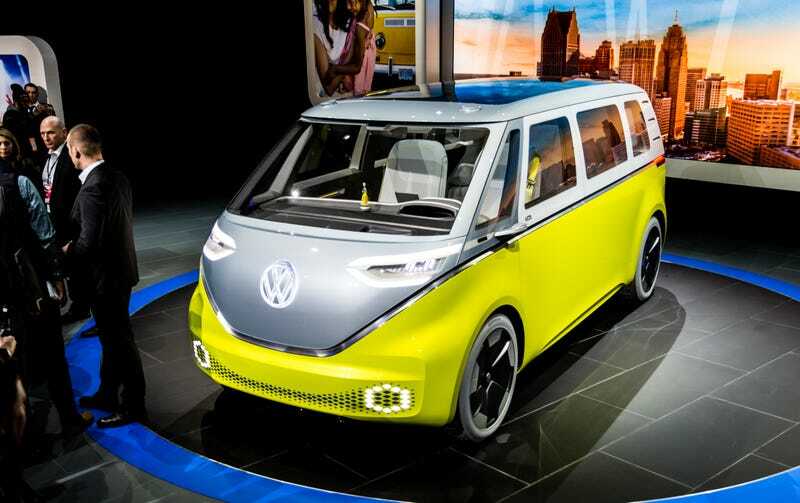 Volkswagen just revealed its fifth concept car based on the idea of modernizing the iconic Type II Microbus. 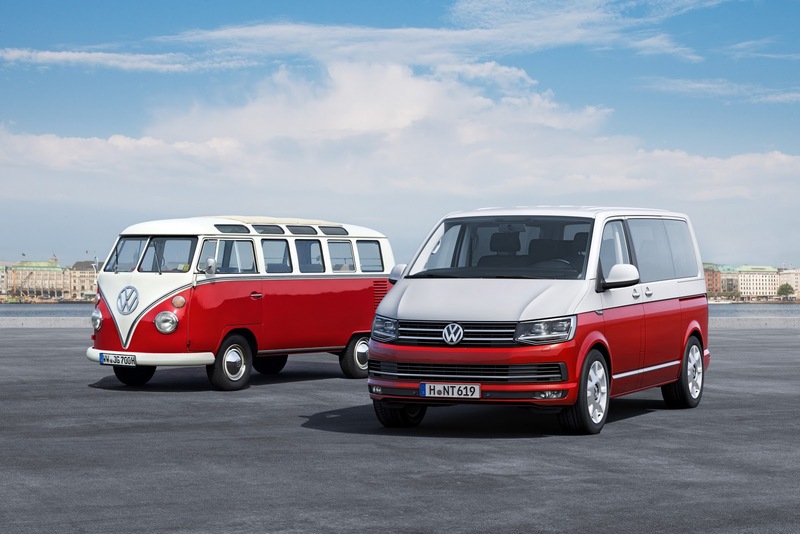 Let that sink in a moment: it’s had four other (well, five other if you count the two-tone version of the T6) Microbus-like concepts, including one from almost exactly one year ago. This latest one, which it’s calling I.D. Buzz, I’m really, really hoping is the one that finally makes it, because I think it’s finally the right car at the right time. In fact, we’re at a point where I’m not sure Volkswagen has a choice not to build it. I just saw the car in person; it’s a very realized concept, that was clearly a very expensive thing to build. That suggest they’re at least somewhat serious, but, again, we’ve been burned before. All the talk was very noncommittal, as you’d expect, but the company does seem invested, at least emotionally, in the idea. I talked to VW of America’s CEO, Hinrich Woebcken, and I got the sense that VW understands the potential value of the vehicle. We’ll see, right? As I’ve been harping on and on for over a year, an unashamedly nostalgic, electric neo-Microbus is pretty much Volkswagen’s only option to regain positive attention and take focus away from the still-ongoing Dieselgate mess. It’s an iconic vehicle, one with a vast reserve of nostalgia and goodwill from decades as a pop culture icon, and a resurrected Microbus that’s electric would very neatly avoid any emissions issues and indicate a very reformed Volkswagen. Plus, unlike the nearly-anonymous seven-seat SUV VW Atlas, a new Microbus is something that only Volkswagen can really build—well, provided that Tesla doesn’t somehow manage to steal their birthright. To be brutally honest, I don’t see any way Volkswagen can get away with not putting this (or a plausible production version of the Buzz concept) into production. I mean, think about it a moment: VW could play it safe, and make cars like the VW Atlas and the new Tiguan instead: on paper, that’s what Americans are supposed to want to buy. But both of these cars have many rivals that look basically the same, cost about the same, and perhaps even have better reliability records, all in addition to not coming from a company that cynically lied and cheated to buyers all over the world. Or, they could build a car like the new Microbus, which, really, nobody (well, maybe Tesla) else can or will build. A unique car with an already-established character and interested base of potential buyers, many of whom are Baby Boomers with cash to spend. So, let’s take a deeper look at the latest electric-dream Bus, and see if it’s actually what Volkswagen needs, and how likely it is to get to market looking at least something like what we’re seeing in the concept. First, the good news is that the Buzz is vastly better than last year’s Budd-E when it comes to exterior design. Where the Budd-E seemed almost afraid to really embrace the nostalgic heritage of the original Type II bus, the Buzz is bold and unashamed in quoting its ancestor. Buzz has all the crucial design elements needed that define the Microbus: a two-tone paint scheme, divided by a V-shaped frontal motif; a monobox shape, maximizing the interior volume; a wide D-pillar, with some detailing that at least suggests the rear air intakes of the original. The Buzz ticks all these boxes, and goes even further than I dared imagine. Specifically, the greenhouse’s use of white (or body colored) pillars between the discreet window areas instead of blacked-out pillars (as is now common for almost every car) gives the whole machine a distinctly retro look and feel, and yet it still manages to feel modern and high-tech. I think the look is dead-on for what Volkswagen needs: it’s clearly a modern Microbus, and not something that you could mistake for anyone else’s car. While it appears capable of doing the same jobs, space-wise and practicality-wise, as any modern minivan, it’s got something that nobody else’s minivan can touch: the ability to be really desired. Also an encouraging note, from what these cutaway drawings seem to suggest, the Buzz looks to be built on the same electric (and, significantly, rear-motor’d) platform as last year’s Budd-E, and their other recent electric concept cars. Hopefully, this means that at least that platform is well into its development, and could be a viable basis for this new Bus. Of course, this is a concept car, and there’s plenty here that’s pure concept-car horseplay: all the lighting, for example. All that accent lighting around the logo and the distinctive V-line is almost certainly not going to make it to the filthy, grim Real World, and the dot-matrix headlights and driving lights are pretty implausible as well. The taillights aren’t much better, since they appear far too small to meet current American standards. The lack of mirrors is also not going to happen, and those wheels are concept-car indulgences through and through. All of these aren’t really that big a deal, though: even if everything I just mentioned was replaced with parts-bin stuff, the fundamental design is still distinctive and strong enough to work just fine. What could be a deal-killer, though, is how serious VW is about autonomy. There’s no more ardent believer that the future of self-driving vehicles are boxy rooms-on-wheels than myself, but if VW thinks they need self-driving ability before releasing a modern, electric Microbus, they’re fools who deserve to have Tesla steal their thunder. Sure, down the road, they can add autonomous versions. Hell, they should. But waiting until autonomy is ready before releasing a new Microbus for sale would be an insipid decision. So, we’re back to that basic question: will they build the damn thing, already? They have a design that could do what they need, and they appear to have a platform—an emissions-free platform—that can get the job done, too. They have the look, the mechanicals, the hook, they have everything. Do they have the guts? I sure hope so.